When I first saw the mock-up for the Queen Anne’s Revenge woven wrap – skeptical does not begin to describe my feelings. Skulls are admittedly not my thing though I know lots of people are really into it. I just wondered if there would be a market for such a thing, and if it would end up over the top cartoony. Then one day it arrived on my doorstep, the newest release by Smitten With Wovens. I took it out of the box, and was stunned at how well it turned out. Like every other Smitten I have ever felt, it came out of the package pretty crunchy. I tossed it into the washer and dried it on low heat, and out came a fairly soft and pliable medium-weight woven wrap. It is 100% cotton, and weighs in at about 260 g/m2, pretty typical as Smitten’s go. What made this wrap really special, was how amazing the print turned out! The Scuttle colorway they sent me is an Ecru warp with a Clay weft. The color difference is so understated, that from far away you cannot even tell that there is something on the wrap. It presents as a true natty, making it totally appropriate for any occasion, formal or otherwise. The subtlety of this colorway made something as silly as a Skull and Crossbones set against a Victorianesque lace motif – actually reach a level of refined elegance that was totally unexpected. I found that I could easily integrate it into my outfits, and whenever I brought it around other wrappers for show and tell, there was not a single person who didn’t like it. Looks aside, it also wraps very well. 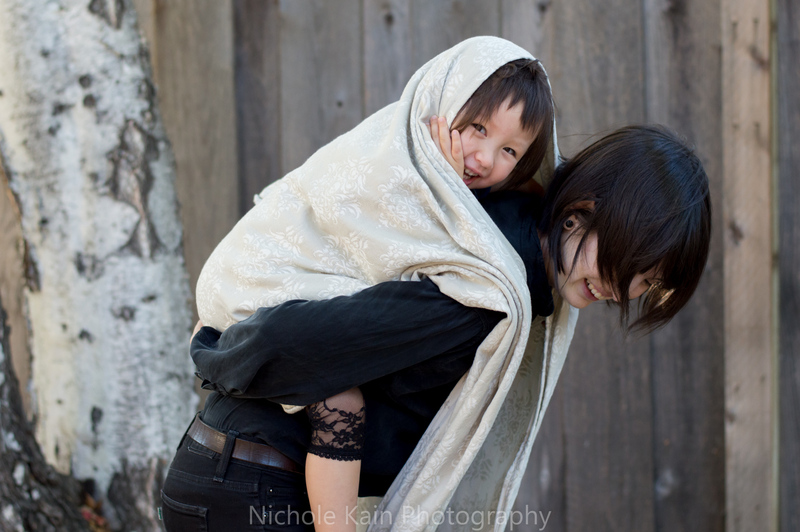 I was able to try it out in many different carries, as I wore it to a photo shoot. 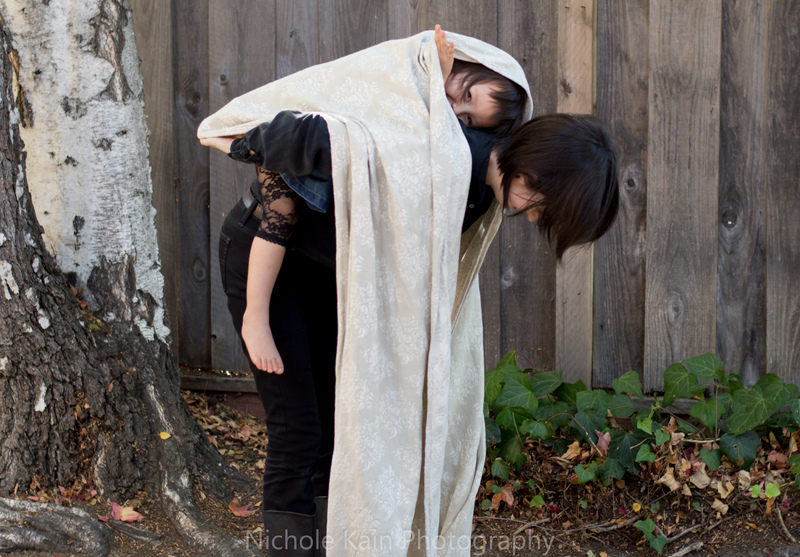 We tried out Double Hammock Tied at Shoulder, Double Hammock Rebozo, a Ruck, and of course – a Reinforced Rear Rebozo Ruck (RRRR!) The wrap passes slid really easily, making all our Double Hammocks and fancy finishes no problem to accomplish, and it had just the right amount of grip to stay in place one it was on. 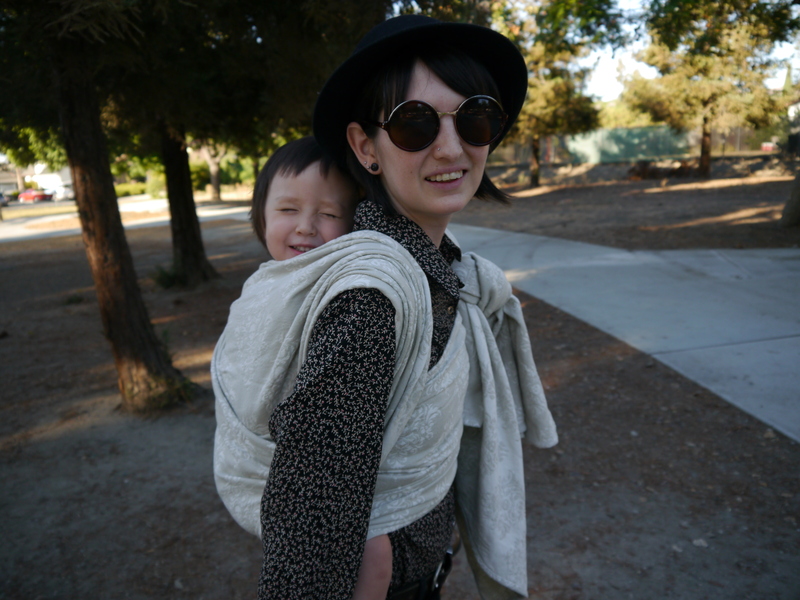 It was not a particularly stretchy wrap, it had what it needed to get those really nice “mold to your body” passes, but not so much that after you have been wearing your 30lb 3 year old for a while the carry is sagging and your back is aching. 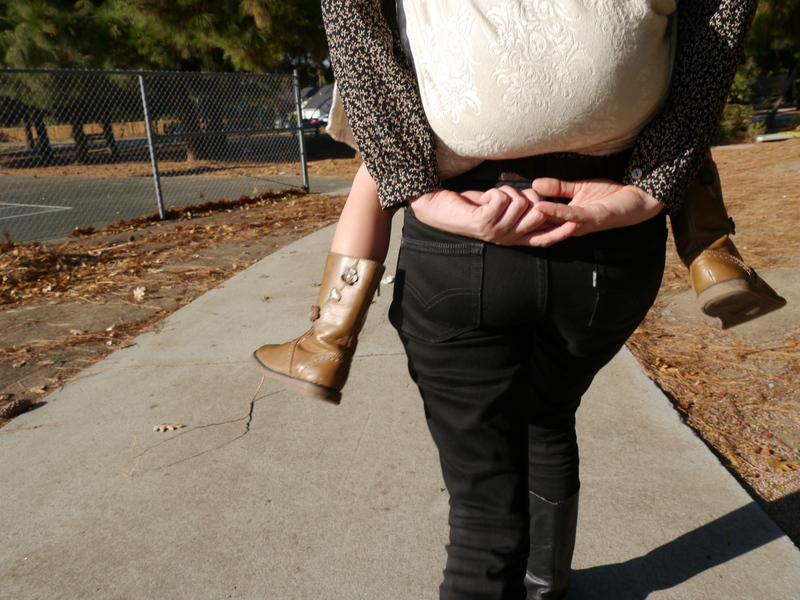 It was definitely supportive enough for a toddler, and 28” wide – giving you plenty of width for a leggy wearee. Still, it was pliable and soft enough to be used with an infant as well. It is medium thick, but the knot seemed huge for some reason. I personally love a giant woven knot, but if that’s not your thing… you may not be into it. If you have owned a Vena Cava or a Tala… this feels different. It is drier, and a little more textured. It reminds me of a broken in Yaro La Vita, or maybe a budget Ankalia in hand. It is nice to see some different textures coming out of the mill that Smitten has been working with. It makes me really excited to see what else they can come up with. Like all their other releases, Queen Anne’s Revenge is easy on the pocketbook. A size 5 (4.2 meters) retails for $130 USD, with a portion of all the proceeds going back to one of the Bay Area La Leche League chapters. I mean, not like we need another excuse to buy baby carriers, but I always feel happy supporting brands that live their values through their business practices – and Rachel and Matt, the husband and wife team behind Smitten With Wovens, always do just that. Their products are Made in the USA, woven and finished in American textile mills. They come in recycled material packaging, with a used book that has been rescued from a landfill. I cannot say enough amazing things about these guys, and am always happy to try anything they send my way.